Continuum mechanics usually considers the theoretical and computational description of standard single-phasic materials in the framework of either solid mechanics, fluid mechanics or gas dynamics. However, growing complexity in material modelling combined with the request of users leads to a growing interest in porous-media mechanics, where porous solid materials with fluid or gaseous pore content are investigated on a macroscopic scale. 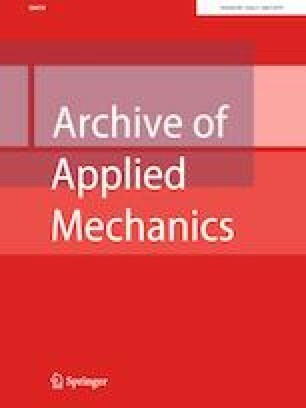 In this regard, the present article reviews the theoretical and numerical framework for the description of geomechanical and biomechanical problems including elastic, elasto-plastic and visco-elastic solid behaviour partly combined with electro-active properties. For this purpose, the Theory of Porous Media is applied for an elegant consideration of the coupling phenomena of porous solids with pore fluids, no matter if the fluids have to be treated as inert fluids or as fluid mixtures. In the sense of a review article, different computational examples are presented to illuminate the possibilities and challenges of porous-media mechanics. We would like to thank the German Research Foundation (DFG) for financial support of the project both within the Cluster of Excellence in Simulation Technology (SimTech) under Grant Number EXC 310 and within the Collaborative Research Centre “Interface-Driven Multi-Field Processes in Porous Media” under Grant Number CRC 1313 at the University of Stuttgart.